WWE TLC: Tables, Ladders and Chairs kicks off this Sunday, and WWE Superstars will face each other with tables, ladders, and chairs at their disposal. The show will feature Superstars from both Raw and Smackdown Live. On the Raw side, Bobby Lashley and Elias were scheduled to face each other in the event, but last night on Raw it was announced that the match will be a ladder match and a special object will be hanging above the ring, which Lashley and Elias will have to retrieve. Elias and Bobby Lashley have been feuding with other for several weeks on Raw and even faced off in the ring at some point. Lashley formed an alliance with Raw GM-elect Baron Corbin and Drew McIntyre and together they laid waste to Elias. Elias and Bobby's feud reignited and they were scheduled to face each other in a ladder match at the TLC PPV. Their feud continued on this week's episode of Raw which lead to a new stipulation being added to their match at TLC. Elias took on Lio Rush on Raw this week with Bobby Lashley in his manager's corner. After Elias delivered a sit-out powerbomb to Rush and went for the pin, he was attacked by Lashley, breaking the pin. Lio Rush handed the guitar to Lashley, allowing him to hit Elias with it. This allowed Lio Rush to get the pinfall victory and walk out victorious. 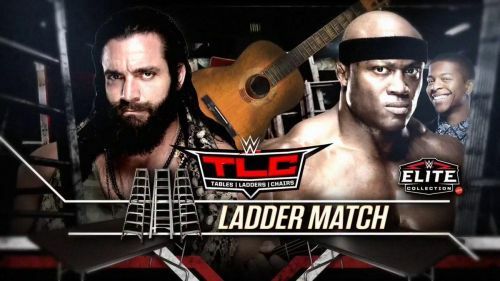 WWE went on to announce that Elias and Bobby Lashley will face each other in a ladder match with the guitar hanging above the ring. The first person who retrieves it will use it as a weapon. WWE TLC: Tables, Ladders and Chairs takes place this Sunday and superstars from Raw and Smackdown Live will battle it out. Other matches include Dean Ambrose vs Seth Rollins for the Intercontinental Championship, AJ Styles vs Daniel Bryan for the WWE Championship, Ronda Rousey vs Nia Jax for the Raw Women's Championship, Becky Lynch vs Asuka and Charlotte for the Smackdown Women's Championship in a TLC match and Baron Corbin vs Braun Strowman in a TLC match among others. WWE Rumor Mill: Braun Strowman's Opponent For TLC Changed?